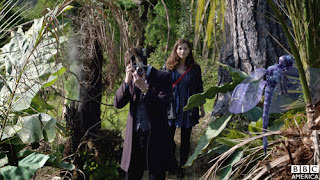 Beyond Fandom: 'Doctor Who' 709 Review - "Hide"
'Doctor Who' 709 Review - "Hide"
Get out the salt and call the Winchesters, this week’s episode of Doctor Who, “Hide”, was a very spooky affair. This definitely wasn’t the typical ghost or monster that the Winchester bros handle and if they had then this tale might have had a more tragic ending indeed. The Superwholock phenomenon always amuses me especially considering the way in which the Doctor likes to handle aliens and monsters compared to characters like Sam and Dean Winchester. As we’ve seen time and time again on Doctor Who, there are frequently aliens who look terrifying but are really just misunderstood which was the case again in this episode near the end. The pair of monsters are just star-crossed lovers separated through time and space, desperate to get back to each other. It’s something that the Doctor catches onto at the very end when he goes back to save the very monster he ran from in total terror earlier in the episode. So yeah, the Winchesters would have handled it by killing the monsters without realizing the situation could have been resolved quite peacefully. The ‘ghost’ wasn’t what it seemed either, instead she turned out to be a trapped time traveler who could only be saved by Emma, an empathic psychic, throwing her a lifeline into a pocket universe. I enjoyed that she turned out to be her descendant, it wasn’t as good of a twist as the star-crossed monsters but it was an enjoyable addition to the story. 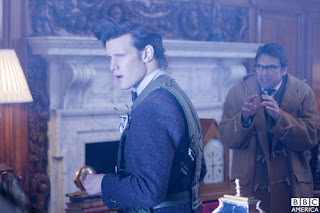 So really, Clara and the Doctor were playing less at Ghostbusters and more toward Cupid in this episode. 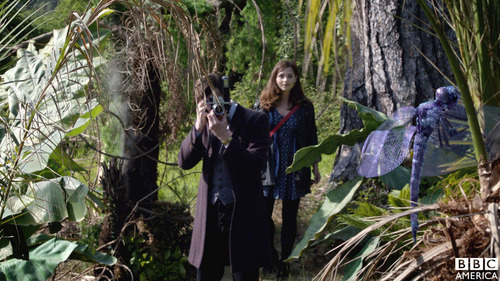 The ghosts weren’t what brought the Doctor there in the first place however, he needed to speak with the psychic about Clara. The Psychic tells him that she’s a completely ordinary girl which only furthers the theory that this Clara is the genesis of whatever he’s trying to find. 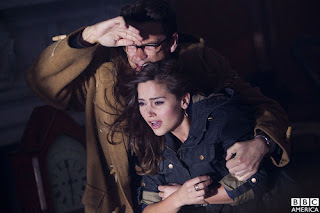 Dalek!Clara and Governess!Clara come after her, I’m almost certain of it. While the psychic may not think she’s anything particularly out of the ordinary, the TARDIS continues to think otherwise as it again refuses to let her inside on it’s own. The only other companion (in New!Who anyway) that she’s done this to as well is Jack Harkness--she doesn’t like him being a fixed point in time. It’s either related to the TARDIS’ problem with Harkness or she’s picking up on the Doctor’s own uneasiness toward what she is. I’m also wondering if the TARDIS manifesting to her as herself is going to be significant down the road as well. 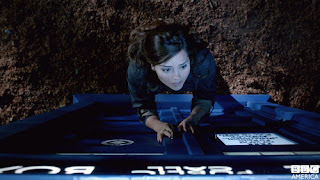 Eventually the TARDIS gives in and not only let’s Clara inside, but it also lets her have a go at piloting the blue box through time and space when the Doctor’s in danger. The only other companion who’s driven the TARDIS was River. 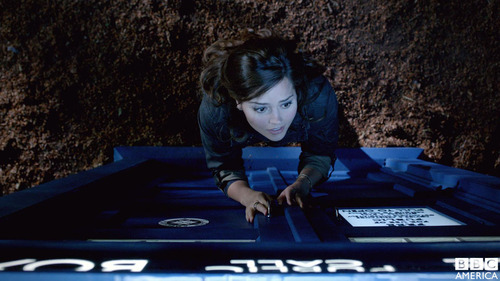 If Clara was in fact driving it on her own it speaks to how brilliant she really is. 'Bates Motel' 1.07 Review "The Man in Number 9"
'Doctor Who' 707 Review - "The Rings of Akhaten"
'Revenge' 218 Review - "Masquerade"